The Hopper/Batson duo has returned once again! After being shut down by Thomas Nelson, they have headed up copyrights, editing, and marketing all on their own, an impressive effort for such a large volume. 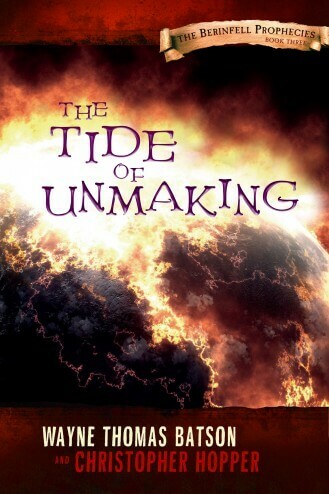 The Tide of Unmaking is definitely aimed at the 8-14 year range, but could be enjoyed by anyone. However, I found it to be populated with some corny lines (along with good ones, don’t get me wrong) and (sans spoilers) a predictable plot. If that doesn’t bother you, and if you haven’t read much fantasy, you’ll be surprised and really like it. Plot and writing aside, the morality behind the book was very good. Many characters developed a lot further, but I couldn’t relate to them as well as a younger audience would. Similarly, if secular readers were to pick this up, they would find “salt and light” sprinkled throughout. In conclusion, this is a good book for younger readers, but not for an older audience looking for a new story. This ebook was provided free by the authors. I was not required to write a positive review, and the opinions expressed are my own.